(PRLEAP.COM) Vancouver, BC - September 22, 2013 After six years in its North Vancouver location, WerkMaster is moving to a much larger facility in Burnaby, BC. The new location will provide expanded production capacity to meet the growing global demand for WerkMaster's extensive line of floor care equipment and maintenance products. "Quality, durability, versatility and innovative design along with our continued commitment to provide superior customer service and support has led to the successful growth of WerkMaster. Our product distribution has grown significantly since leading companies like Braxton-Bragg, Global Industrial and Home Depot.com are now selling WerkMaster's products," stated Brian Wilson, President of WerkMaster. Wilson further stated, "A select number of Home Depot Tool Rental stores in Toronto and Vancouver are now renting the Scarab, Termite XT and Viper XT for concrete surface preparation, leveling and flattening concrete, polishing concrete, refinishing wood decks and hardwood floors. Designed to remove epoxy coatings, paint, thinset, yellow cutback carpet glue, black VCT vinyl glue, micro toppings, as well as polish concrete, terrazzo, granite, marble and natural stone surfaces, WerkMaster is the perfect choice for contractors and DIY customers." 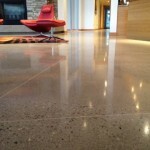 WerkMaster™ is proud to be one of the most innovative and effective manufacturers of award winning concrete polishing and surface preparation equipment, stone, terrazzo, VCT and vinyl restoration and refinishing equipment as well as hardwood floor sanding machines, propane burnishers, concrete densifiers, sealers, cleaners and etchers. WerkMaster's floor finishing and countertop tools are really 7 Machines in 1: Edger, Polisher, Grinder, Buffer, Burnisher, Sander and Stripper that edge to within 1/8" or 3mm of the wall. The Scarab which is designed to refinish countertops, stairs, risers, walls and ceilings edges right to the wall. WerkMaster's Ultra Floor Enhancement sealers, densifiers, cleaners and etchers deliver unmatched quality and performance. UltraGuard guarantees protection from staining and etching for up to a minimum of 24 Hours before having to clean the surface while providing a Slip Rating of .7 on the James Scale. "We are constantly looking for ways to improve our technology" stated Wilson, "moving forward in the industry with a goal of providing the best possible solutions for our customers. WerkMaster is dedicated to providing our customers with superior products and personalized customer service." WerkMaster is the first manufacturer to offer a 3 Year Parts and Labor Warranty on its complete line of electric and propane grinders, sanders, edgers, polishers and buffers.